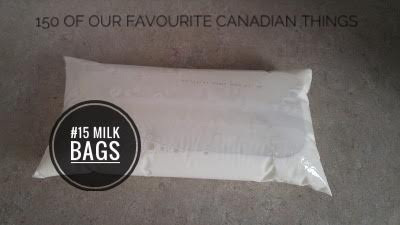 Milk bags are exactly what they sound like, milk in bags. They are plastic pouches of milk containing 1.3L each and are sold in packs of 3 (4L total). Bagged milk really seems to blow the minds of our neighbours to the south. “How does one pour milk from a bag!?”. It’s actually pretty simple, every household has a plastic pitcher which you insert the bag into and then you cut the corner off the bag with either scissors, a knife or a dedicated milk bag cutter (yup those exist). Then you pour the milk onto your favourite cereal, into your coffee or wherever else you desire milk to be. The concept of the milk bag was introduced in 1967 by DuPont and was welcomed with open arms by the dairy industry in Canada as it was lighter and less likely to break in transit than the typical glass bottle at the time. However, consumers didn’t come around to the idea until the 70’s and even today a large portion of Canada’s west coast provinces don’t use them. 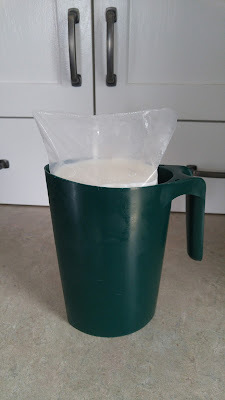 The milk bag in a milk jug ready to pour into stuff. Bagged milk isn’t without its flaws though. Every milk bag drinking Canadian has experienced the dreaded floppy corner pour. It’s when the plastic corner you cut open droops over the pitcher and makes it so much hard to have a consistent pour. And don’t even get me started on people who cut giant holes that pour a litre at a time. As well there is the use of plastics which aren't exactly environmentally friendly. I'm sure down the road someone will reinvent the bag and we will be better off for it. But for now, cut a bag open and pour me a cold glass of milk!